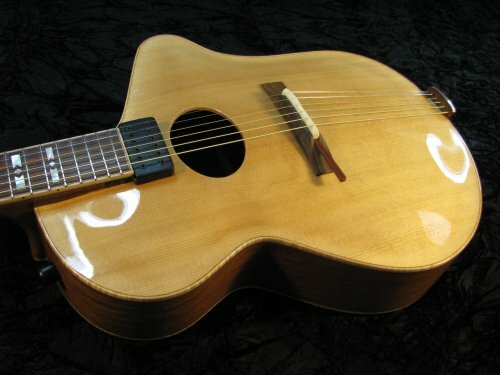 Editor’s Note: Roger Placer returns with his follow up to the recent Lead Up to the Forshage Acoustic Guitar. Here he delves into his observations of this fine instrument. About a month shy of two years since being dreamed up, the long-awaited Forshage ergonomic acoustic archtop arrived on February 26, 2010. For reasons related to where I was during the earliest days of conceiving the guitar, I have dubbed my instrument Captiva. Rather than list out basic specs that have little to do with ergonomics, I will again try to focus on how Captiva’s new or unique design features are faring. Let’s start with the overall shape of the instrument. The lower profile of the guitar is taken directly from Chris Forshage’s own electric Ergo model (Editor’s Note: model first covered in The Forshage Hollow Body Electric Guitar). As such, its primary function is to fit comfortably on the player’s right leg. In doing so, the neck rises skyward (ceilingward?) to an angled playing position that increases the fretting hand’s comfort. As with the electric, this is a key element of Captiva’s ergonomic success. However, because Captiva is not headless, the guitar will not balance in this position independently. Balance is dependent on the picking arm resting on the body in typical fashion. Captiva will fall over if, for example, you instinctively reach up to block a tomato that is thrown at you. In contrast, the electric Ergo will essentially sit still if left untouched. While not ideal, the reality is that one always anchors an acoustic guitar with the picking arm while playing. So in practice this phenomenon does not detract from Captiva’s ergonomic suitability. But it is a difference worth noting. As an aside, it was recently illustrated for me that ideal neck placement was possible even with a decidedly old-fashioned instrument such as a Spanish flamenco guitar. There is a traditional playing position in that genre where the instrument is anchored to the right thigh by the picking arm, forcing the neck upward and allowing comfortable fretting hand access without the need to support it. Unfortunately, this technique does not readily transfer to steel string acoustic guitars, because they are far heavier than a typical featherweight guitarra flamenca blanca. But Captiva’s lower profile takes care of the neck angle, so the picking arm need only provide its natural weight in order to keep the instrument stable. The upper (bass) side of the guitar is traditionally shaped. But the profile of the lower (treble) side completely changes where familiar parts align with the player’s body. The normally corpulent bass side – the “thighs” of the hourglass – sits much lower, relieving strain from the picking arm. The elbow does not need to be hoisted up in order to drape one’s arm over the top. And the arm does not need to be rested on the guitar in an awkward position that jabs at muscles and restricts forearm tendons. While I have not compared it directly with other specific guitars, the relationship of the picking arm to the guitar’s lower bout is similar to a typical electric guitar like a Gibson Les Paul. The net result is a more relaxed and strain-free picking arm. This has always been an issue with full-bodied acoustic guitars, but not so with Captiva. Captiva utilizes exposed-gear Sperzel locking tuners, which are at once slickly modern in function and elegantly traditional in appearance. The guitar’s tuning stability is excellent. While not a comfort-enhancing feature, very stable tuning in a guitar always contributes to its playability in real-world gigging situations. I noted earlier that Captiva was initially to be a headless design. But mounting a tuning tailpiece on an acoustic guitar is a compromise to both aesthetics and practicality. I don’t believe that any tuners on the market today will allow easy adjustment of the heavier strings typically found on acoustic guitars. Even if they did, the physical requirement to have a sizeable solid mounting surface would make them a challenge to install. There are also sonic ramifications to removing mass from the head of the guitar, and while an electric instrument largely overcomes this due to amplification, an acoustic one might not. 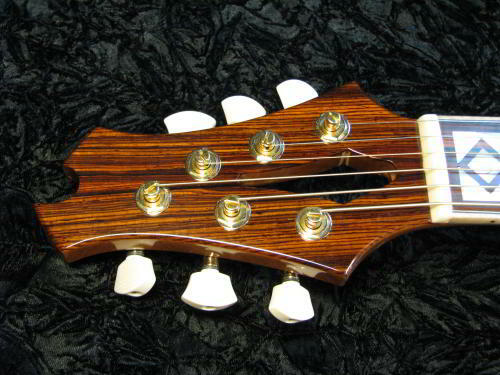 So even with the balance issue noted before, I believe that a headstock was the way to go with Captiva. Chris Forshage shapes a mean neck and frets it to perfection. There is nothing groundbreaking about this, but it’s a fundamental contributor to ergonomic comfort on any guitar. One of the reasons that I went back to Chris to work on an ergonomic acoustic – besides the obvious – was due to the fact that I love the neck on my electric Ergo. The neck on Captiva is not identical (nut width is a hair wider at 1.75”), but it is very comfortable. The cocobolo that Chris prefers for a fingerboard has the tight-grained smoothness of ebony, and a more attractive and luxurious appearance than Indian rosewood. After having it on my electric, I opted to use it again on Captiva. Captiva has no pickguard, which as I explained before can be a distraction. The pickup is mounted directly to the neck by a secure bracket, and just barely – but definitely – clears the top. The combination of these elements clears my mind to pick freely. It might seem strange, but the need to be aware of where controls, pickups, and other supporting structures are placed can have a deleterious effect on the player. That is one of the pleasures of playing an unadorned flattop guitar. There is nothing poking out of the instrument to distract the player, or require him to be conscious of in fear that he will dislodge it. Captiva has only one physical distraction that I am getting used to: The adjustment lever on the bridge juts out in the area where the wrist is moving about. It is theoretically possible to catch a cuff on it and mess things up. In fact, I had read a couple of complaints on the internet about this phenomenon. With appropriate care to select or adjust one’s garments, however, the risk can be prevented. While not directly related to ergonomic concerns, the tone of this guitar requires some discussion. Obviously I did not commission it just to be ergonomic. In fact, one can state – and I think it is perhaps not stated frequently enough – that ergonomics are really a secondary factor in an instrument. Their overarching purpose in life is to clear non-musical impediments from the player’s path. But a guitar that is very comfortable, yet doesn’t inspire musically, is not a desirable instrument. A guitar’s musicality inspires one to pick it up, and its ergonomics should remove physical and mental restrictions from the mechanics of playing it. But enough of that! How did we succeed with the reality of Captiva versus the vision? Captiva manages to have a widely adaptable tonal palette while retaining a fundamental personality. It feels like a jazz guitar. But it doesn’t feel at all limited to that genre. I believe that the guitar is a great success overall, meeting many expectations of the vision. Where it falls short it surprises in complementary areas that are also appealing. My fundamental impression is that Captiva is a relatively simple instrument that happens to possess a unique form. It has few moving parts, basic electronics, and uses traditional materials and construction techniques. However, there are a few subtle yet inventive elements that contribute to how straightforward it is. The tailpiece, for example, serves its purpose as a string anchor, and does so with no moving parts. It transparently grounds the strings. It integrates both strap pin and endpin jack. And it is both solid (brass) and organic (wood), merging the best of these two materials. The truss rod adjuster is inset within a hollow at the base of the headstock cutout. There is no truss rod cover or exposed hardware to contend with, but it remains perfectly accessible. I love design elements like these; they contribute to a sense that a guitar has everything it needs, and nothing it doesn’t. Exchange these attributes with “normal” treatments, and the guitar would lose a bit of its design elegance. This is one of the beautiful things about engaging in purposeful design, versus always reverting to what is traditional. 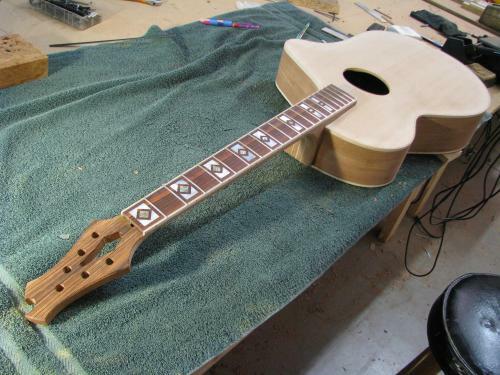 Initially conceived as a flattop, Captiva became an archtop with “flattop characteristics” later in the game. And with this primary objective, it’s one version of a success. What I mean by this caveat is simply that Captiva’s hybrid features are but one interpretation of how it could be done. The guitar has the punch and immediacy of an archtop, and readily accepts complex chords and fluid melody lines. It has the correct tonal signature for jazz standards and old-time music. The small body does limit the bass response somewhat, but the bracing and bone saddle contribute sustain and some of the harmonic richness that archtops often lack. The result is a guitar with a rich middle, tight but solid bass, and singing treble. It does not have the raw volume of a larger f-hole archtop guitar. Yet it is more responsive to a delicate touch. So it can be played fingerstyle or with lighter picks and still produce a satisfying playing experience. By varying one’s technique, it seems to sound at home with strummed folk style music, arpeggiated acoustic alternative stuff (my mainstay), or tightly flat-picked jazz comping. If we plug in, and let the Kent Armstrong floating PAF take over, Captiva spreads its wings. The tone is electric jazz with an acoustic edge. Right there in the same camp as similar guitars I’ve owned, particularly a 1980 Gibson L-5C with a floating BJB pickup. Then again, If I play lightly and modulate where I attack the strings, Captiva can be coaxed into sounding more like a plugged in flattop acoustic guitar. Very versatile. The two saddles produce distinctly different tones and responses; the bone is quick, loud, bright, and has a “ping” to the attack. The wood is softer, smoother, with a “fuzzy” attack that is very warm and appropriate for jazz music. I like the ability to change such a fundamental aspect of the instrument with just a saddle swap. Perhaps the most appealing attribute of Captiva’s sonic flexibility is that I’m free to approach it without preconceptions. Guitarists embrace convention even as it limits them. Hard rock? Les Paul. Soul? Telecaster. Blues? ES-335. Jazz? Archtop. Many players obsessively seek benchmark guitars for styles of music. And often, we limit what we play on these guitars to that style. So it can be liberating to play a guitar that defies the rules because it didn’t exist when the rules were written. And that is partly why some of us enjoy talking about ergonomic guitars, and their tendency to buck convention, in the first place. And it’s also why the effort to commission a truly custom instrument can be so very worthwhile, despite the time and expense involved. I think luthiers have fertile ground for exploration based on the foundation laid by Captiva. I think that the headless option can be explored – are there new hardware options that might enable it? Can the minor weight distribution issue be corrected, either with a headless design or with other compensation? Can the guitar be made bigger, to get more acoustic volume, and still incorporate the ergonomic lower side profile? (I see potential in the cutaway area.) Can something be done to offset the body thickness, and bring the neck closer to the player? (Perhaps a Manzer wedge?) A true flattop version would probably be straightforward using a different bridge. Other pickup options are probably worth exploring. And so on! I hope to see some of these things appear in the coming months and years. For the foreseeable future, though, I am not going to be a seeker of instruments. I’m going to seek inspiration by playing my new guitar! And special thanks to Chris Forshage for his creativity and dedication over the long period of time it took to make Captiva a reality. Thanks for a very interesting post. The point that the design of the treble side leads to less strain on the picking/strumming arm is particularly interesting – though one or two pictures of someone playing the guitar would help getting the point through. Though I appreciate that this is high-end lutherie, I’d like to see such a design mass produced so those of us on tighter guitar budgets could have one too. The videos help a lot. Congratulations on a very fine guitar. Hey. Neat guitar. But that adjustment lever I think it’s a – xuse me for pushing the issue – major gaffe. Borrowed from D’Aquistos archtops or D’Angelicos, I see absolutely no reason why that level could be reversed and point out from the first string side of the bridge instead pointing downwards. The body is already thick enough to be forced to stretch out your arm to play anyway, any more “thickness” added to this is an ergonomic drawback. I find absolutely no reason for this, no matter how much I’ve researched the net, and probe deep into other luthiers resources (GAL publications etc). Also, I can’t think of that this guitar just has to be this way in order for it to produce the greatest of sounds. Which I think it does. Other than that, great.